This page serves as an overview of the various types of hoaxes, lies and other deceptions perpetrated by Reuters in recent days, since the details of the scandal are getting overwhelmed by a torrent of shallow mainstream media coverage that can easily confuse or mislead the viewer. Almost all of the investigative work has been done by cutting-edge blogs, but the proliferation of exposés might overwhelm the casual Web-surfer, who might be getting the various related scandals mixed up. In this essay I hope to straighten it all out. It's important to understand that there is not just a single fraudulent Reuters photograph, nor even only one kind of fraudulent photograph. There are in fact dozens of photographs whose authenticity has been questioned, and they fall into four distinct categories. 1. Digitally manipulating images after the photographs have been taken. 2. 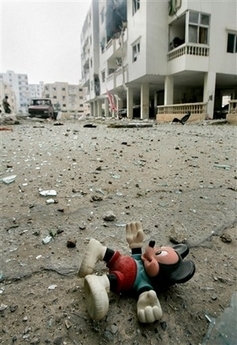 Photographing scenes staged by Hezbollah and presenting the images as if they were of authentic spontaneous news events. 3. Photographers themselves staging scenes or moving objects, and presenting photos of the set-ups as if they were naturally occurring. 4. Giving false or misleading captions to otherwise real photos that were taken at a different time or place. All of these forms of fraud have the same intent: to serve as propaganda for Hezbollah, and to make the Israeli attacks look as brutal as possible. And, taken together, they raise a very serious question: Can any of the coverage by the entrenched media be trusted? The ever-growing scandal now involves other news services as well; at the bottom of this page are numerous examples of bias and fraud by other agencies, including Associated Press, The New York Times, and others. This is what has been getting the majority of coverage in the media, because it is the most clear-cut -- even if the actual significance or newsworthiness of the photos involved is not particularly great. This is the fraudulent photo that has gotten by far the most coverage. This hoax was first exposed on August 5 by Little Green Footballs, when a reader named "Mike" pointed out the photo to LGF's Charles Johnson, who incontrovertibly demonstrated that the image had been altered using the Photoshop "clone" tool. For more info, click on the link above; this case has also been covered extensively throughout the mediasphere. This is an untouched version of the original photo before it was digitally altered. Reuters released it on August 6 when they admitted the doctored photo was indeed fraudulent, and announced they were no longer going to work with Adnan Hajj, the photographer who had Photoshopped the image. No word on what punishment the editors who released the obviously fake photo to the world would receive. Hajj used the Photoshop "clone" tool to copy portions of the smoke-column and repeatedly paste it into the sky, to make the smoke look larger and darker -- though his manipulations really didn't change the effect of the photo to any great degree. His claims that he accidentally added the extra smoke when he was merely trying to remove some dust flecks from the picture are so absurd as to barely even merit comment. The other instance of digital photo doctoring was discovered by Rusty Shackleford at The Jawa Report on August 6. 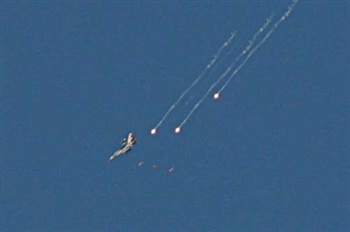 The original Reuters caption for this photo was "An Israeli F-16 warplane fires missiles during an air strike on Nabatiyeh in southern Lebanon." 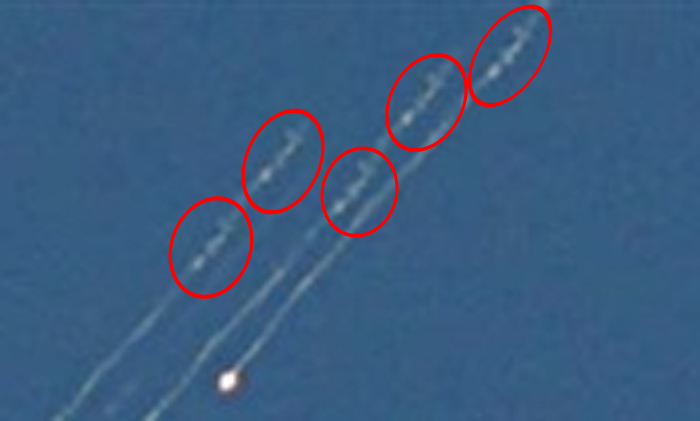 As Shackleford pointed out, first of all, those are not missiles depicted in the photo -- they're defensive flares. But more importantly, the photo had been doctored to show three flares, when in fact there had only been one. This image, also shown on the Jawa Report, demonstrates that the clone tool had again been used to copy portions of the photo and paste them in repeatedly elsewhere. In this case, the trails of one flare were copied and lengthened to make it look like there had been three flares. Click on the link above for a detailed explanation and several more photos proving the case. The photo-hoaxster in this instance was again Adnan Hajj, proving beyond doubt that he was very familiar with how to alter images in Photoshop. Ynet News featured an article on this photo manipulation as well. After the public outcry over the obviously fake photos, Reuters fired Adnan Hajj and pulled all his photos from distribution, admitting that both photos were doctored. They made no mention of how or why their editors allowed fake photos to be released as real news, perhaps hoping that the firing of Hajj would put an end to the scandal. But Photoshopping images was only one of several ways in which Reuters has committed journalistic fraud during the war in Lebanon. This is where the Reuters scandal started: with bloggers noticing that some of the images showing the aftermath of the July 30 air raid on Qana looked fishy. There are by now dozens of different photographs from that day whose authenticity has been seriously questioned, so all I can present here is a small representative sample. The first series that raised suspicions was this one, pointed out at many blogs, of a green-helmeted "rescue worker" who seems to parade around with the corpse of a child for an extended period of time. The blog EU Referendum had the most complete photo series compilation, showing that each image individually might be accepted as an unposed authentic news photo, but that when one considers all the photos taken that day by Reuters, AP, and Agence France Presse, it becomes obvious that the entire scene was some kind of gruesome theater performance, apparently with actors posing as rescue workers parading around with a few corpses, seemingly posing for the cameras instead of evacuating the bodies as efficiently as possible. EU Referendum pointed out that if the time stamps on the photos are taken at face value, then the rescue operation becomes even more farcical, with bodies unnecessarily put on display for hours, though the news agencies later claimed that the time stamps do not necessarily reflect the actual time each photo was taken. Lost in the argument over this detail is the fact that the photos were widely doubted even before the time stamp issue, and that even a casual glance at the photo series from Reuters and the other agencies reveals that, in whatever order they were taken, the images seem to reveal at the very least a partly staged scenario, in which unprofessional "rescue workers" seem more concerned with how they and the bodies appear on camera than they do with conducting an actual rescue operation. These doubts were compounded when additional photos of the mysterious "Green Helmet Guy" (or "Mr. Green Helmet" as he's sometimes called) were found from other rescue operations in other parts of Lebanon (such as here, for example), at which he similarly seemed to pose for the camera. Many bloggers speculated that he is in fact a Hezbollah "set designer" and media relations officer whose job is to milk maximum propaganda value from each photo opportunity, with the cooperation of willing photographers, who must witness his shenanigans in person, but not report on them. However, on August 9, the ruse was completely unmasked by the TV newsmamagazine "Zapp" on the German NDR television network, which aired video of Green Helmet Guy acting as a movie director and staging propaganda photos and videos while pretending to be a rescue worker. After the video was posted online, most leading bloggers (such as at Little Green Footballs) felt the evidence was now absolutely conclusive that Hezbollah was staging most of the imagery coming out of Lebanon. The German news site Bild uncovered pictures of Green Helmet Guy staging similar gruesome propaganda shots in 1996, as The Jawa Report noted, proving he's been at this business for quite some time. Ynet News had an excellent article summarizing the different aspects of the Qana photo opportunity. Incredibly, in response to the initial questions about the Qana pictures, Reuters issued a statement that completely denied any of its photos were staged, stating, "Reuters and other news organisations reviewed those images and have all rejected allegations that the photographs were staged." But their denial has fallen on deaf ears in the blogosphere, as more and more seemingly staged photos are discovered every day. Many bloggers have stated that some photo-stringers in Lebanon are not merely willing dupes for Hezbollah propagandists, but occasionally even participate in the staging of scenes themselves. Though this form of fraud is much more difficult to prove, several examples have cropped up of vignettes that just seemed "too good to be true" for them to be naturally occurring scenes. 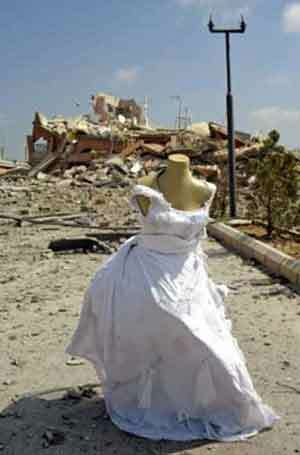 This Reuters image, for example, which was found in various media outlets, came with this caption: "A mannequin adorned with a wedding dress stands near the site of an Israeli air raid in Qana July 31, 2006, where more than 54 women and children were killed a day earlier. 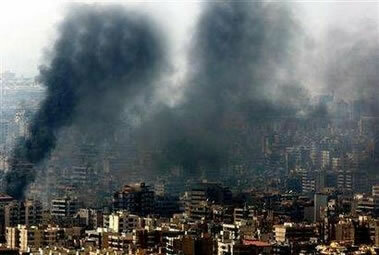 REUTERS/Sharif Karim (LEBANON)." C'mon -- an explosion large enough to knock down a building happened just a few yards away, and an entire day has passed with hundreds of rescuers and media members and everyone else running around, and after all that, a mannequin in a wedding dress is discovered standing right next to the bomb site, as if posing in front of the wreckage? And that no one noticed it until then? A much more likely explanation is that the photographer -- or someone helping him -- found the mannequin elsewhere, and placed it exactly where he wanted for that "perfect shot." Yahoo also had in its news photos this picture of yet another Lebanese mannequin amazingly upright in the middle of destruction. As was pointed out on the Ace of Spades blog among others, this burning Quran, supposedly ignited by Israeli missiles -- also miraculously captured by Adnan Hajj of Reuters -- is almost certainly a staged scene. 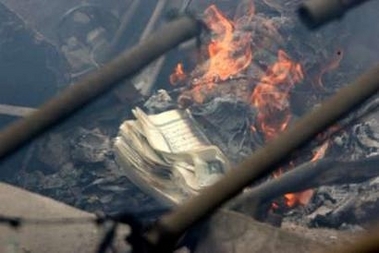 The odds of any book -- much less a Quran -- bursting into flame hours after an air strike, right when a photographer was there to snap its picture, are rather slim. Since stories of desecrated Qurans have gotten so much media play in the past, it seems as if the Reuters photographer arranged the exact kind off iconic image he knew would arouse outrage in the Muslim world. All of these pictures were taken by Reuters photographers in Lebanon, except for the first Mickey Mouse image which was taken by an AP photographer. While it may be possible that these photographers all just happened to stumble on toys and stuffed animals perfectly positioned for maximum emotive response, the cumulative effect of all the pictures together (along with others visible on Slublog) suggests that some if not all of the photographers moved the toys to be better positioned for a good photo. Several readers have also written in to point out how new, clean and undamaged the toys look -- unlikely, if they had all just been in an explosion. But this is not a definitely conclusive example of fraud -- it's almost impossible to prove that a photographer moved an object to his benefit. Instead, the images just feel faked. Ace of Spades has some more pictures of the ubiquitous Lebanese toys. 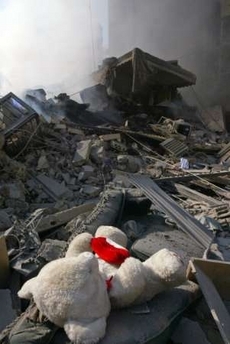 Many readers alerted me to this Free Republic post which purports to show a man distributing toys amidst the rubble, confirming the staging. The same photos were posted in The Tampa Bay Primer. However, if the sequence of the photos is reversed, he could just as easily be collecting the toys and putting them into the suitcase -- which is exactly what the captions for the original photos claimed here and here. In this instance I agree with Hot Air that this sequence of photos don't prove that the man was distributing the toys, because we don't really know in what order the photos were taken. Pending further evidence, we'll have to set these photos aside. It is worth noting, however, how remarkably clean all the toys are, considering they supposedly have been rescued from a destroyed building. UPDATE: Reader "Don R." writes to say, "There's another point that's even stranger - sort of an elephant-in-the-room thing: I can understand gathering your kids' toys from your demolished house, AMONG OTHER THINGS. But I can't imagine coming back, filling my suitcase *only* with cute stuffed toys, then leaving. What, this guy had no grown-up mementoes? Nothing of sentimental value other than Minnie Mouse and friends? This does seem odd - and in that context, I would lean towards the interpretation that the guy was indeed *unloading* toys rather than gathering them." Great point! 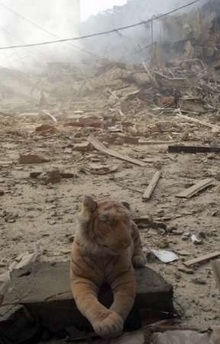 Strata-Sphere also has a mini-roundup of photos possibly staged by photographers, including this "too perfect" image of a schoolgirl's pristine photo lying on the rubble of a mosque destroyed in Qana. Power Line again drew attention to another form of photojournalistic fraud, this time possibly committed by the Reuters editors themselves. 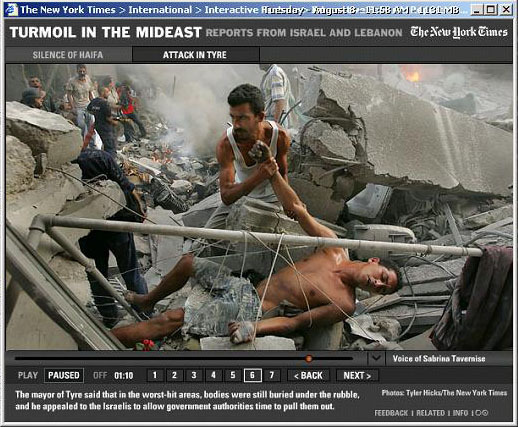 This photo, as Power Line pointed out, was captioned, ""Journalists are shown by a Hizbollah guerrilla group the damage caused by Israeli attacks on a Hizbollah stronghold in southern Beirut, July 24 2006. (Adnan Hajj/Reuters)." But look at the next photo below. 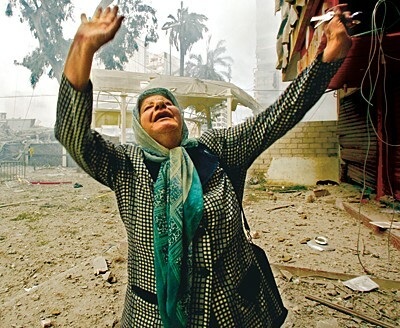 Here, the caption says, "A Lebanese woman looks at the sky as she walks past a building flattened during an overnight Israeli air raid on Beirut's suburbs August 5, 2006. (Adnan Hajj/Reuters)." 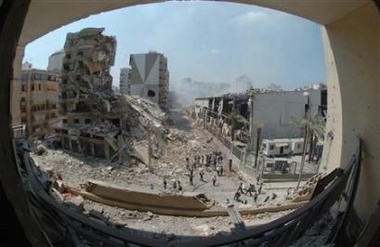 But a cursory glance shows that it's the exact same destroyed buildings in both photos. If they were already destroyed on July 24, they couldn't have been destroyed on August 5, especially since the damage is identical in both pictures. It's quite obvious that photos of the same scene were re-released to make it appear as if Israeli bombing raids were continuously hitting Beirut, when in fact Reuters was just recycling the same damage over and over. 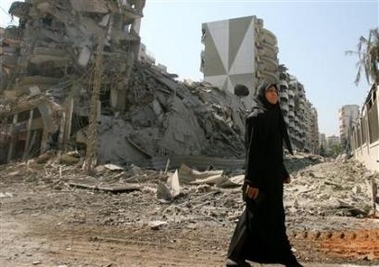 Further demolishing the credibility of this photograph is yet a different image of the same woman by AFP, this time "inspecting the destruction," in a scene in which she is obviously cooperating with the photographer -- contradicting the implication of the Reuters photo in which she is supposed to be just a passerby. Yet, as was revealed in this article on The Shape of Days site, captions for news photos are mostly written by the editorial staff, with the photographer supplying only the basic facts. It was up to the Reuters editors to properly caption this photo, and if it was misattributed, it is entirely their responsibility. Hang on! 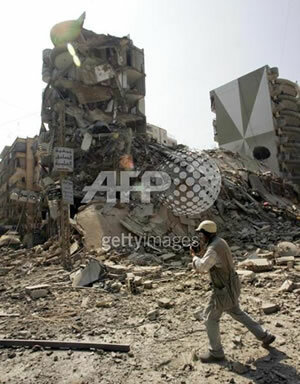 As revealed on Little Green Footballs once again, the building was already destroyed as of July 18, according to this picture at Getty Images, which captioned it, "A press photographer takes pictures of the devastated southern Beirut suburbs of Dahyieh Junibiya, 18 July 2006." So, a building that was demolished before July 18 was recycled again and again as "fresh" damage committed by Israel. 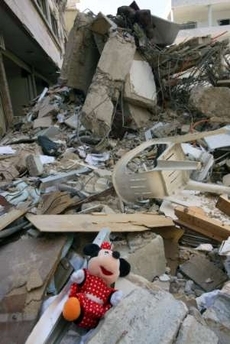 In the next example, as discovered by the Drinking from Home blog, a Lebanese woman somehow had her house destroyed twice, two weeks apart, by the Israelis. 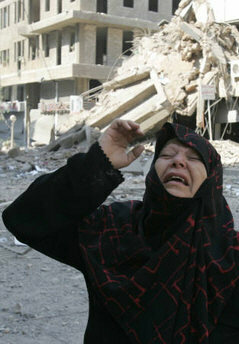 In this first photo, Reuters claims, "A Lebanese woman wails after looking at the wreckage of her apartment, in a building that was demolished by the Israeli attacks in southern Beirut July 22, 2006. REUTERS/Issam Kobeisi." But wait! 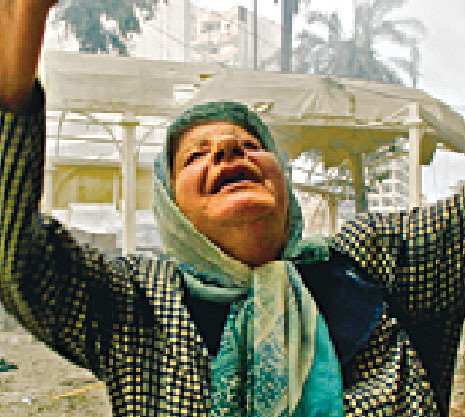 Here she is again, in a photo supplied by AP: "A Lebanese woman reacts at the destruction after she came to inspect her house in the suburbs of Beirut, Lebanon, Saturday, Aug. 5, 2006, after Israeli warplanes repeatedly bombed the area overnight." As Drinking from Home points out, it's definitely the same woman. The photo captions, supplied by two different news agencies, contradict each other: one says her home was destroyed on July 22, the other on August 5. Which leads one to question whether the woman had anything to do with the building at all, or if she was just asked to pose in front of it for drama's sake. Either way, the editor's captions are necessarily untrue, since her home obviously couldn't have been demolished twice. The photos may or may not be authentic, but at least one of the captions is a falsehood. Ynet News also featured an article about the discrepancy. A close-up of the somewhat low-resolution image appears to faintly show the distinctive scar on the woman's left cheek, confirming it is her despite the different outfit. As Paul writes, "Once again we see the -- unmistakable -- eyebrowless Wailing Woman coming home only to find her third Beirut apartment destroyed. Different location of course, and this time she is wearing an up-market outfit: aqua silk scarf, checked coat, sling bag over her shoulder and holding car keys. She has apparently just got out of her car, seen the damage, slung the bag over her shoulder -- as you do when you discover your apartment is no more -- and gone for it, the double hand Heavenwards Wail." 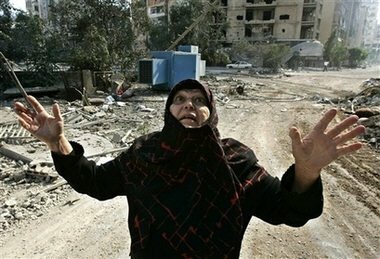 Zombietime reader Tom P. sends this AP photo (from a link that is now expired, unfortunately) that had the following caption: "Lebanese Asma Srour walks on the rubble of her extended family's house, destroyed during the month-long Israeli forces' offensive in the southern border village of Aita al-Shaab, Lebanon, Saturday Aug. 19, 2006. (AP Photo/Lefteris Pitarakis)." 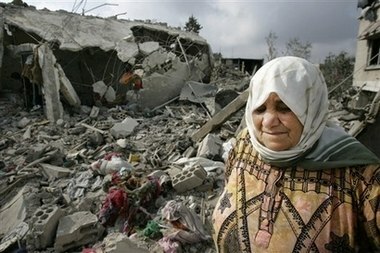 The scar on her left cheek once again suggests that it is the same woman a fourth time posing in front of a destroyed home (though identification is not absolutely certain). If all of these are indeed the same woman -- which seems possible, though we can't say with 100% certainty -- she may simply be an amateur photographer's model taken around to various sites to act distraught in front of different damaged buildings. 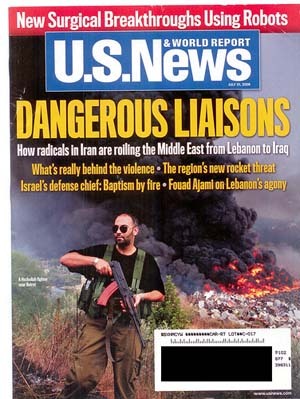 These pictures of a Hezbollah gunman -- as pointed out by Hot Air, jester_6 and Riehl World View -- not only appeared on the cover of the July 31 edition of U.S. News and World Report, but were captioned, "A Hezbollah gunman aims his AK 47 at a fire caused by an explosion in Kfarshima, near Beirut, Lebanon, Monday, July 17, 2006. 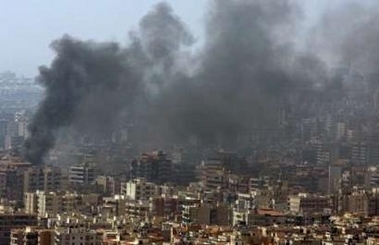 Lebanese TV stations broadcast video pictures Monday claiming to be an Israeli military aircraft falling to the ground in the area, but Israeli military said no aircraft was shot down over Beirut and there was no immediate confirmation of the cause of the explosion." The photos were taken by both Reuters and AP photographers. 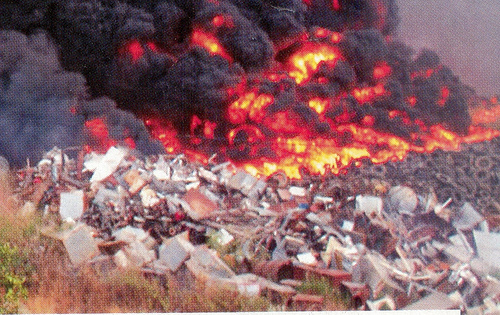 But a close-up reveals that the fire, as the gunman and the photographers must have known, was nothing more than tires burning in a garbage dump. The gunman was pointing his weapon at the tires merely for dramatic effect. It turns out the fire was in fact caused by a Hezbollah missile that misfired, flew erratically for a short distance and exploded in the dump after its launcher was struck by an Israeli attack. Rumors quickly spread among the locals that an Israeli aircraft had been shot down, but they dissipated just as quickly when Israel denied that any of its aircraft had been hit, and no Israeli wreckage was ever produced from the tire fire. An Al-Jazeera camera crew accidentally filmed the misfired Hezbollah missile in the distance as it spun through the air and landed in the dump. Hezbollah made the best of the incident by using the resulting fire as a backdrop to a posed photo shoot with willing Reuters photographers. Note also that the fire's true origins and the falsity of the rumor about the downed Israeli aircraft were already known by July 18, the day after the photo was taken, but U.S. News and World Report still used the photo and the misleading caption in its July 31 edition, long afterwards. The photo was too appealing not to use, apparently, but an accurate caption -- something like, "A Hezbollah media relations officer poses in front of a harmless tire fire in the distance, that was ignited by a Hezbollah missile" -- would have diminished its impact. UPDATE: As revealed in these two posts at Little Green Footballs, the photographer who took the photos of the burning tires, Bruno Stevens, supplied accurate captions when he turned in his photos, but his editors at Time intentionally altered the captions to be factually wrong. One can only speculate as to their motivation. More self-contradictory captions -- along with another bit of possible staging -- was uncovered by Cathy Brooks, a reader of Power Line, in a series of photos also taken by Hajj and released by Reuters. 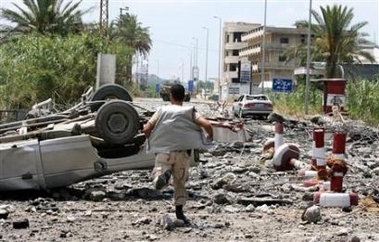 As the full series of photos displayed at Power Line shows, one of the "citizens" running pointlessly back and forth across the Qasmiya Bridge in an earlier photo magically becomes a "civil defense representative" in this picture, which had this caption: "A Lebanese civil defence representative runs shortly after Israeli warplanes bombed Qasmiya Bridge near Tyre in south Lebanon July 12, 2006." 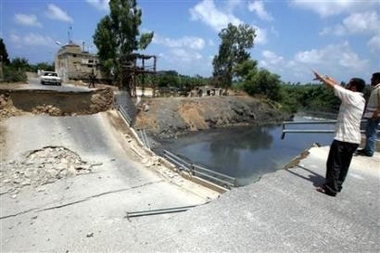 Power Line's analysis finishes with a final photograph of a completely different damaged bridge, which is also identified as the Qasmiya Bridge with this caption: "A Lebanese citizen gestures near the ruined Qasmiya Bridge near Tyre in south Lebanon shortly after being bombed by Israeli warplanes July 12, 2006." So which one is the Qasmiya Bridge? One of the captions has to be wrong. But the main thrust of the Power Line article -- that one of of the damaged cars was dragged around as a prop -- turned out to have an innocent explanation. In a later photo, the exact same damaged car seems to be quite a distance away, once again on its roof. However, Seerak, an astute photo expert on Little Green Footballs, pointed out in this detailed comment that the photographer was likely to have been alternating between powerful telephoto and wide-angle lenses, which produce only the appearance of the car being moved. The foreshortening is so extreme that the untrained eye at first doesn't notice the identical elements at different scales in the backgrounds of the various pictures. And for some, it's hard to believe the effect could be produced simply by different lenses. The Dog of Flanders blog also is convinced that the top photo was taken with a telephoto lens, accounting for the apparent movement of the car. Several photo experts emailed to say essentially the same thing. Dog of Flanders also speculates (in the link given above) that there may be two bridges near Qasmiya, which were both captioned as the Qasmiya Bridge. So the issue is a little muddled around these particular bridge photos. There is certainly a minor problem with the identification of one of the men depicted (citizen vs. civil defense representative). And many people are convinced that the "action sequence" seems rather obviously staged -- the men look like they're running frantically back and forth for no other reason then to make a good picture. And the bridge may or may not have been intentionally misidentified. But because this case is so unclear, it's not as well-known as the other obvious frauds. As Power Line concludes in an update to their original post, "What is indisputable, I think, is that 1) Hajj sent Reuters photos of two obviously different scenes on different roads, saying that both were the aftermath of Israel's bombing of Qasmiya bridge, and Reuters apparently didn't notice; and 2) the bridge photos were staged, with Hajj's subjects running to and fro for his benefit, well after the bombing took place." What to make of all this? As is demonstrated on this page, Reuters has committed not just one instance of fraud, and not just one type of fraud, but four distinct categories of fraud. Now, of course there is a real war going on, and there is real damage, and authentically tragic scenes. No one is denying that. So, with all the actual honest footage of unstaged war imagery floating around, why is Reuters resorting to supplementing its coverage with obviously fake photos? Several theories have been posited in opinion pieces since the scandal broke. Here's a summary of the various possibilities. Theory A: The Reuters editorial staff is sympathetic to the aims of Hezbollah, and is using propagandistic images exaggerating Israeli violence to increase world pressure on Israel to stop its attacks, thereby giving Hezbollah a chance to regroup, and claim moral superiority. Reuters, according to this theory, is taking advantage of the chaos of war, and the chaos of the international media coverage, to promulgate staged or contradictory news reports, knowing that their audience is distracted by an onslaught of too much information. Working on the assumption that no one person would ever see enough different media outlets to notice the fraud, which only becomes apparent when comparing different images which are published in a wide variety of media outlets, Reuters has slipped the false reports into the news stream. An adjunct to this theory is the "fake but accurate" philosophy of journalism, in which it is deemed acceptable to fabricate evidence (such as the staged photos, or in an earlier instance, the Rathergate memo) if it illustrates a "higher truth." A believer in this philosophy would say that since Bush must have been derelict in his National Guard duty, the contents of the damning phony memo are technically and morally true, even if the memo itself was a forgery. Similarly, given a pre-existing assumption that Israel is intentionally committing dastardly deeds in Lebanon, it's morally acceptable to manufacture evidence of their malfeasance, especially if we can't find the actual evidence in situ. This mindset is similar to that of crooked policemen who plant evidence on a suspect they believe to be guilty, since otherwise he might go unconvicted because real evidence is lacking. Doss, a commenter on Little Green Footballs, made a very well researched comment showing the systematic bias in Reuters editorial captions to photos of the war in Lebanon, with (unfortunately now expired) links documenting each point. According to Doss, "Every time, if an Israeli is hurt, it was a 'rocket' that did it; if a Lebanese/Hizb is hurt, 'Israel' did it. 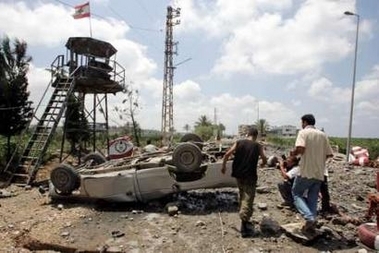 Humans hurt Lebanese, but inanimate objects hurt Israelis, according to Reuters." This clearly points to an anti-Israel bias on the part of Reuters. There is additional evidence that at least one Reuters staffer also works to promote the pro-Arab station Al-Jazeera, while another issued death threats to "zionist pigs." In response to this article which cites "Moira Whittle" as "Reuters' head of PR," Rayra, another LGF commenter, noted in this comment that this article and this article both cite Moira Whittle as also being a media contact for Al-Jazeera, meaning the same person promotes the interests of both organizations. 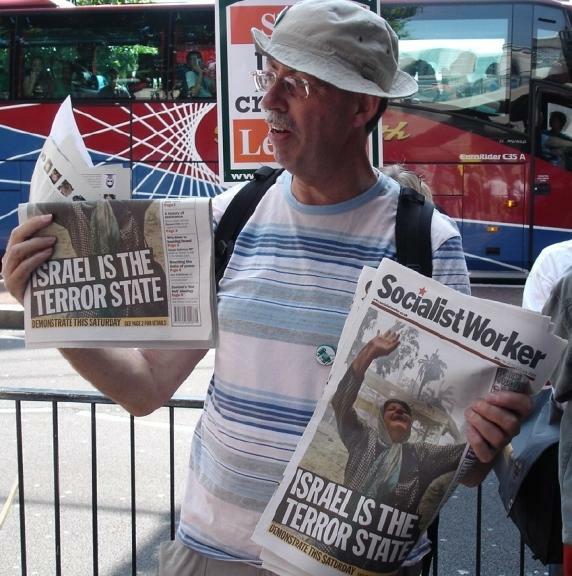 And on May 25, 2006 someone at Reuters sent a death threat to Charles Johnson of Little Green Footballs from "zionistpig@hotmail.com" and stating "I look forward to the day when you pigs get your throats cut." Reuters management eventually "suspended an employee" for sending the threat, but they never would reveal who it was. Ed Driscoll wrote an illuminating essay documenting how Reuters has been baised against America and Israel and toward Muslim groups for quite some time, both due to their use of stringers and due to an insitutional political agenda on the part of the editors. Theory B: The stringers employed by Reuters are sympathetic to Hezbollah, and successfully duped the politically neutral Reuters editors into publishing propaganda. To accept Theory B, you'd have to conclude that the Reuters editorial staff are cataclysmically incompetent, and were unable to notice numerous frauds so obvious that "untrained bloggers" could easily spot them. However, this theory is somewhat supported by the fact that Reuters had outsourced part of its captioning operations to Singapore and to Bangalore, India, where captions were written by "entry-level employees" who had little direct knowledge of the situation on the ground. There's no way for readers to know which captions were written by senior editors and which were written by inexperienced young workers who might be overly trusting of the photos' veracity. Theory C: The stringers employed by Reuters simply wanted to make a name for themselves, and resorted to fraud to obtain the most spectacular images, regardless of their political outlook. Again, Theory C requires an almost unbelievable level of incompetence on the part of the Reuters editorial staff. This theory is also doubtful because the propagandistic nature of the photos and captions is almost always anti-Israel. Zombietime reader "Bernie" sends the following observation: "There is an assumption in your rejection of Theories B and C that while the stringers could be motivated by greed and the desire to achieve fame through striking images, the editors must have other motives like sympathy to the Hezbollah cause or incompetence. On the contrary, I'm sure that there is just as much pressure in the editorial world to fake impressive photos, both because editors within Reuters no doubt compete for recognition in the photos they produce through their stringers, and also because Reuters as a whole is competing with a number of other news agencies. This is the explanation that feels more correct to me - in an organisation like Reuters it is a lot easier to disguise widespread greed than widespread deliberate propaganda manufacture. Reuters and those within it need no other motive than producing what the rest of the media want to buy, and being richly rewarded by a commission-based incentive scheme." Interesting analysis! Theory D: Reuters photographers and editors are intimidated by Hezbollah, and publish Hezbollah's propaganda out of fear for their lives. Well, Howard, there's no doubt about it: Hezbollah has a very, very sophisticated and slick media operations. In fact, beyond that, it has very, very good control over its areas in the south of Beirut. They deny journalists access into those areas. They can turn on and off access to hospitals in those areas. They have a lot of power and influence. You don't get in there without their permission. What I would say at that time was, it was very clear to me that the Hezbollah press official who took us on that guided tour -- and there were Hezbollah security officials around us at the time with walkie-talkie radios -- that he felt a great deal of anxiety about the situation. And they were telling him -- I just listened to an explosion going off there, coming from the southern suburbs. They were -- they were telling him -- a second explosion there. They were telling here -- rumbling on -- they were telling him get out of this area, and he was very, very anxious about it. But there's no doubt about it. They had control of the situation. 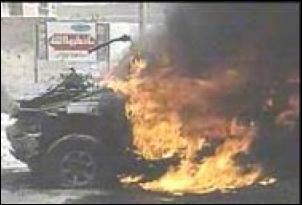 Another description of how Hezbollah intimidates journalists in Lebanon can be found on the Anderson Cooper blog. And this camera crew from TV2 in Norway had its film destroyed and its members menaced by Hezbollah when they tried to film Hezbollah firing rockets at Israel. The article is in Norwegian, but reader Martin H. supplies this translation of the key section: "While TV 2 stood and filmed a rocket launching in the town Tuesday, there was a dramatic confrontation with Hezbollah. 'Hezbollah took our camera, but we got it back after they had taken out the tape. We only got a warning. I don't know what they mean with this, but a number of the other journalist colleagues have said that they have also experienced the Hezbollah-soldiers as very aggressive when it comes to photographing,' says Græsvik." Of course, if Theory D is true (that the journalists are afraid of Hezbollah) then Theory B can't also be true (that they are sympathetic to Hezbollah). Perhaps our mistake is to view Reuters as a monolith, when in fact different individuals have different motivations: The editorial staff in the offices and the Western journalists operate in fear, but the local stringers collaborate with Hezbollah, so that the bias has two separate origins. Theory E: Reuters photographers and editors publish Hezbollah's propaganda to insure continued access to still more Hezbollah propaganda. According to Theory E, playing along with Hezbollah's game is the price journalists must pay to gain access to the war zone. But in so doing, the only reports they ever file from the war zone serve Hezbollah's purpose. It's a vicious cycle in which one sacrifices one's impartiality in order to "get the news" -- and thus the news ends up becoming propaganda as a result. The only photojournalists Hezbollah allows to operate in areas it controls are ones who are either sympathetic or will cooperate with Hezbollah in staging photos. The media are thus limited in their choice of photographers to use if they want to cover that area. If one media outlet decides not to use Hezbollah-approved photographers, their competitors will, thus anyone who steps out of line is put at a disadvantage. As a result, it's probably quite the open secret within the media that such types of fraud go on. The editors in question probably don't apply a very high level of scrutiny to the authenticity of the photos, and probably care more about their impact upon sales than their authenticity. Theory F: Reuters and other news agencies always support the underdog in any conflict. In tune with the sort of "bleeding heart" liberal ethics held by most in the journalism trade, Reuters staffers always tend to sympathize with whoever is perceived as the victim or underdog, regardless of their moral history. The struggle then comes down to this: who can lay claim to victims status, and thus get favorable media coverage? According to this theory, Hezbollah managed to gain the upper hand in the victimhood competition by identifying themselves with the Lebanese people. Israel lost the victimhood sweepstakes because Israel is too organized and efficient in its response to Hezbollah rocket attacks, whereas Lebanon was more chaotic and emotional. A quick survey of how the media has covered a wide variety of historical events tends to confirm this theory. Whoever is perceived as a victim at any particular moment earns media sympathy, even if sometimes it leads to absurd contradictions. Frequently, for example, when someone is murdered, the media idolizes the victim. But later, when the murderer is convicted and sentenced to death, suddenly he assumes the victim mantle, and the public is treated to tales of his awful childhood, and of how the death penalty is cruel and unusual punishment. Similarly, and more to the point, in the 1945-1948 period, Jews were appropriately perceived as the victims of the Holocaust and of massive population displacement duiring WWII, and as a result the media supported the creation of Israel in 1948. But as soon as Israelis stopped acting like victims, and started to create a successful society that overshadowed its neighbors, little by little Israel as a whole lost the sympathy of the media. Whoever fails, loses or lags behind in any situation will always receive the most positive media coverage. There is no real moral component to this philosophy. In "underdog ethics," nobody bears responsibility for his or her plight. And as a result, Theory F proposes that Reuters and other media do not politically sympathize with the aims of Hezbollah per se, but only slant coverage in favor of Hezbollah because they were sustaining the most damage in the war. If the tables were turned and Hezbollah had superior firepower and invaded Israel, the media would favor the victim once again -- but in this case, it would be Israel. There is a great deal of overlap between the Underdog Theory of Media Bias, and the sort of diffused "cultural Marxism" that pervades much of modern society, in which "oppressed" third-world peoples are always portrayed as more virtuous than any "colonialist" state. Because Western-style democracies always create wealthier and more powerful societies than do other political systems, the cultural Marxists in the media will always bias coverage against developed countries and in favor of less-developed countries. UPDATE: The Augean Stables blog had an insightful essay about the reasons for anti-Israel media bias, inspired by this essay; it explores many of the same potential explanations discussed here, along with other possibilities as well. So -- which of these theories is true? At this stage, it's impossible to tell. The actual truth may be a combination of all six theories. Unbiased? Ponder all the evidence above and decide for yourself: Is Reuters unbiased? This scandal casts doubt not just on Reuters' coverage of the current war in Lebanon -- it casts doubt on all media coverage of this war, and of all wars in the past. How long has such chicanery been going on? Could it be that the public for the first time is learning that the media is not as impartial as it has always claimed? As can be gleaned from the examples above, Reuters is not the only news service involved in some of these bogus photo reports coming out of Lebanon. Photographers from Associated Press and Agence France Presse, in particular, have been present at some of the staged scenes as well, and AP's captions have repeatedly drawn criticism from several bloggers. 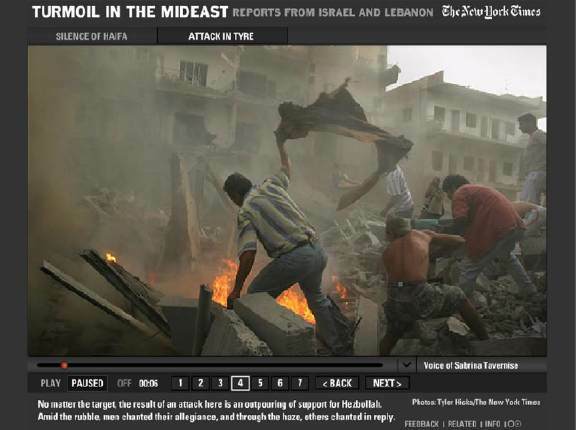 In this first image, one of a series on the N.Y. Times site, a man with a greenish cap (on the right) is seen gesturing at the rubble. In the second image, you can see the same man at the lower right, wearing the same cap and baggy, washed-out trunks. And in this final picture, the same man is seen -- easily identifiable by his trunks, his hat pressed under his arm, and his distinctive nose -- seemingly pretending to be dead as someone else tries to lift his "fallen comrade." The Times captioned the image, "The mayor of Tyre said that in the worst hit areas, bodies were still buried under the rubble, and he appealed to the Israelis to allow government authorities time to pull them out. (Photo Tyler Hicks The New York Times)." 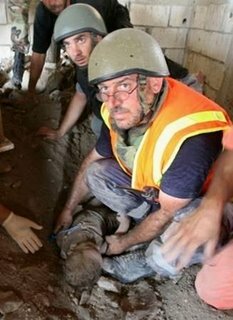 The unmistakable implication is that the photo depicted what the caption was describing -- a "body" still buried under the rubble. In other words, the guy is now supposed to be dead. Here's a clearer version of the final picture. If the original caption is to be taken at face value, it's not only obvious that the man is still alive and only feigning death, making the scene a staged hoax, but that Tyler Hicks, the photographer, must have known that he was only acting for the camera, since Hicks had taken the earlier pictures as well. However, after this was publicized on a variety of blogs, it was discovered (by Michelle Malkin among others) that Tyler Hicks had earlier been interviewed on NPR on July 30, and the same photo was on the NPR site with a different caption, saying that the man "had fallen and was hurt." 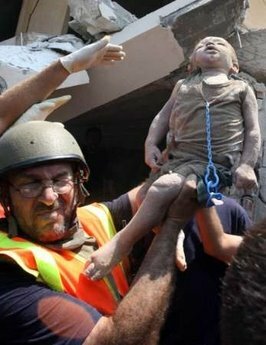 "A picture caption with an audio slide show on July 27 about an Israeli attack on a building in Tyre, Lebanon, imprecisely described the situation in the picture. The man pictured, who had been seen in previous images appearing to assist with the rescue effort, was injured during that rescue effort, not during the initial attack, and was not killed. 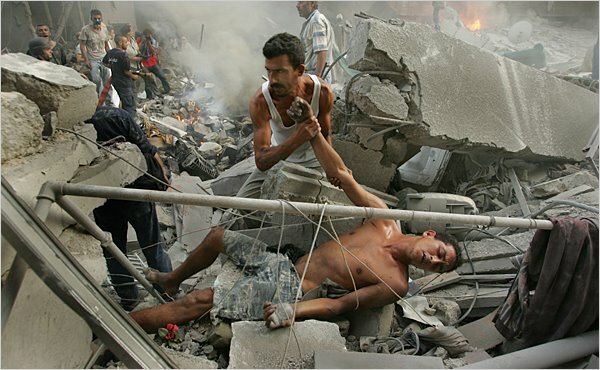 The correct description was this one, which appeared with that picture in the printed edition of The Times: After an Israeli airstrike destroyed a building in Tyre, Lebanon, yesterday, one man helped another who had fallen and was hurt." That's a big improvement, but many people feel the Times only backpedaled because the deceptive online caption was caught by bloggers. Furthermore, many bloggers continue to feel that the man -- whose status was upgraded from dead to merely "injured" -- still looks like he's faking it nonetheless, feigning injury and posing for dramatic effect. If he fell and was knocked unconscious, how did his cap get tucked safely under his arm? If the pole in the foreground fell and hit him, then why is there a coat draped over it? And why is there a fresh rose under his leg? 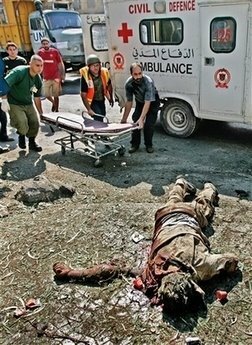 The Associated Press, and photographer Ben Curtis, also came under criticism from EU Referendum for this series of photos which also looked to be clearly staged -- "Mr. Green Helmet" makes another appearance, picking up a strangely bloodless mangled body from an undamaged area, with trucks parked strategically in the background. Sweetness & Light noticed a discrepancy between a story about "heavy equipment" being used to bury bodies in Lebanon -- with the implication that they were so numerous that they had to be pushed around by machines in a mass burial -- and AP photos of the same incident, which showed a single body being placed in a front-loader. The blogs Sweetness & Light and EU Referendum also pointed out misleading captions about a white-shirted man carrying a girl in Qana; various outlets identified him as the girl's father, but an examination of several photos from several sources shows that he is not related to her, and is instead likely a member of Hezbollah. 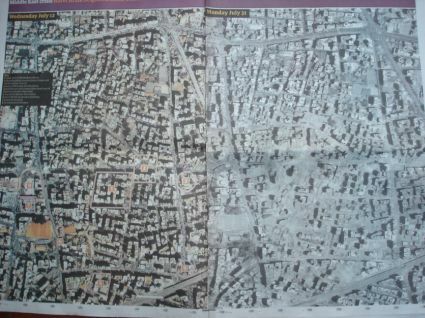 The Daily Ablution draws attention to a two-page spread in the print edition of The Guardian, which shows side-by-side comparisons of southern Beirut before and after the current conflict. In order to maximize the apparent damage, they made the "before" picture be in full color, and the "after" picture a washed-out gray. Is the entire city covered in a uniform gray dust? Or did the Guardian subtly "desaturate" the colors in the "after" picture? This is Beirut. 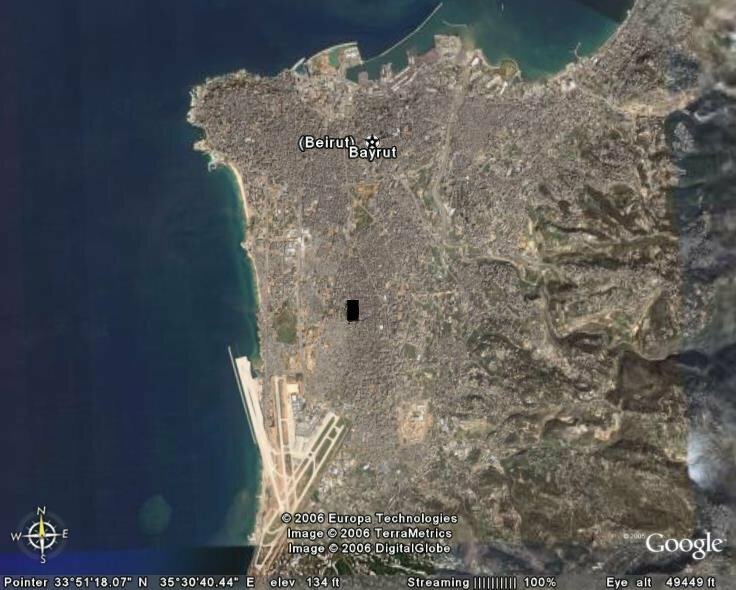 The small black rectangle in the center of the picture indicates the area depicted in the Guardian before-and-after pictures. It turns out that the Guardian only shows 1% of the city -- the 1% that was most damaged, around Hezbollah headquarters. The other 99% of the city -- which was mostly untouched -- was conveniently not shown. Starting on July 25, many news outlets -- including the Guardian -- reported that Israel had deliberately targetted two Lebanese ambulances, severely injuring the patients inside. A July 30 New York Times article stated, "Missiles hit two Red Cross ambulances last weekend, wounding six people and punching a circle in the center of the cross on one's roof." Photos of the damaged roof appeared widely -- the picture on the left appeared the Australian newspaper The Age, and the picture on the right came from the This Is War blog, but they don't say what their source was, or why there is a white background under the hole. 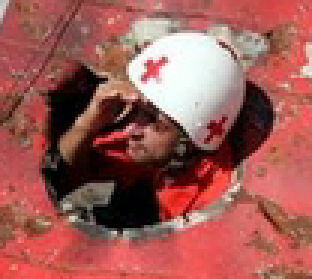 The supposed attack was milked for maximum progpaganda value; here, a Lebanese Red Cross worker pokes his head out of the hole and peeks around. Notice carefully how the this is indeed the same damaged roof in all the photos: there are three white splotches adjacent to the hole in each image, as well as a gash and other distinctive marks. Britain's ITV ran a breathless report (link is to a YouTube video) about the attack, accusing Israel of serious war crimes (targetting ambulances is illegal under most circumstances) and showing the injured. Significantly, however, the ITV report states that journalists were not allowed to see the ambulances themselves, and the movies shown of the damaged vehicles were taken by "local cameramen." The story was swallowed unquestioningly by the media, which broadcast it to a shocked world. The incident went unchallenged for days, until a few blogs started noticing problems with the evidence. 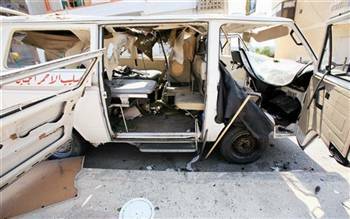 Infinitives Unsplit blog was the first to raise questions, with a good analysis of what really happens to vehicles in airstrikes, as opposed to what is purported to be the damage to this ambulance. Reihl World View then had a detailed rebuttal, pointing out that if a missile really had gone through the roof, the ambulance would have been utterly destroyed. And yet pictures of the vehicle -- such as the one shown here, supplied by "local cameramen" -- reveal it to be comparatively intact. 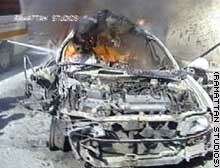 In previous conflicts, when Israel admittedly did target specific vehicles with missiles (such as when it attempted to kill Hamas militants), the cars ended up looking like this or this -- burned to a crisp, and completely mangled. And yet this ambulance had rather minor damage, inside and out. But there's an even more serious flaw in the story. As was concisely stated by the Virginian blog, "NBC shows a picture of an ambulance with a hole in its roof as "proof" that Israel is attacking ambulances. 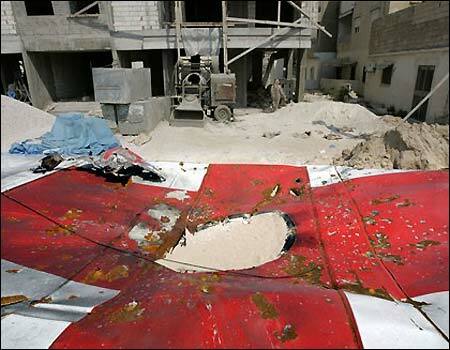 The problem is that the hole, which is right in the middle of the Red Cross on the roof, could not possibly be the result of a hit by any weapon. 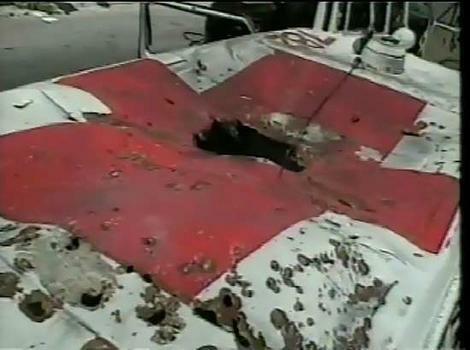 A shell or missile that size hitting the ambulance would not leave the rest of the vehicle intact. All that you would see would be twisted wreckage and a debris field. A more reasonable explanation for the hole is the removal of the emergency light or siren which also explains why the hole is centered precisely on the cross." 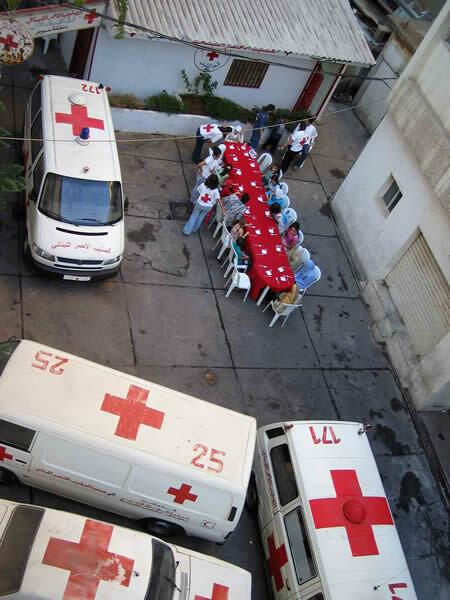 This photo, found on the Lebanese Red Cross site itself, shows (in the lower right) how some of their ambulances do indeed have sirens or lights in the exact center of the cross. Notice also that the size of the siren/light in the photo is exactly the same size as the "missile hole" in the roof of the damaged ambulance. Now, look again at the top three photos, and notice how there are extensive areas of rust wherever the paint is scratched off. Rust does not appear in a matter of hours like that, or even days. It takes weeks or months for a vehicle roof to start rusting. Notice also in the picture with the Red Cross worker looking out of the hole that there are distinct notches around the perimeter of the perfectly circular hole, apparently there to help attach a light or siren. Lastly: just how good are Israeli pilots anyway? Are they so masterful they they can hit an ambulance in the direct center of the cross on its roof, while aiming from a moving aircraft a great distance away? At night? And if it has such astounding precision in its weaponry, then why use it to target a random ambulance on a country road? So, what's the real story? The Lebanese and the global media insist that the ambulances were deliberately targeted by Israel, for the specific purpose of killing civilians and rescue workers -- a serious war crime. Israel, for its part, completely denies the charge, not only affirming that they never target rescue vehicles, but dismissing the claim that there even was an accidental attack on this ambulance at all, much less a deliberate one. The blogs have pointed to evidence indicating that the entire incident is a fabrication; that the ambulance was dragged out of a junkyard, where it had been rusting for months after someone had stripped off its siren or light. EU Referendum has a comprehensive overview of the entire "Qana incident" with Green Helmet Guy, posted here in several chapters -- and also as a pdf booklet. 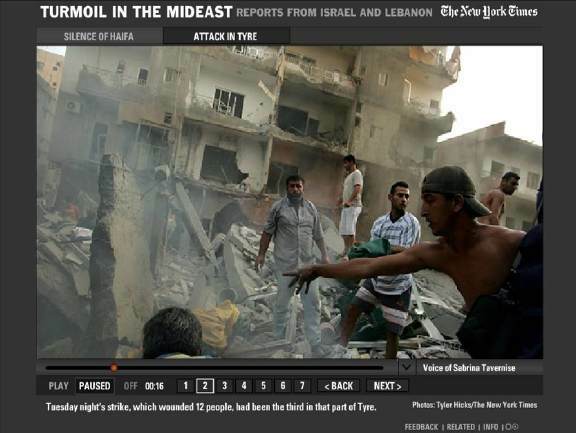 Aish.com made an excellent Web video based on this "Reuters Photo Fraud" page, with a credit to zombietime at the end. The nicely produced three-minute movie touches on all the highlights of the scandal as presented here. Thomas Lifson at Real Clear Politics also has a good essay summarizing some of the ever-widening aspects of the scandal. Media Matters embarrasses itself trying to defend the authenticity of all the Reuters photographs coming out of Lebanon, falsely claiming that Reuters' denial of the accuracy of its Qana time-stamps somehow defuses the entire issue. This post at James Taranto's Best of the Web -- about an AP photograph that at first appeared to show a dead body getting up -- turned out to be a false alarm when Augean Stables pointed out that the body likely had rigor mortis in a sitting position. John Burtis in Canada Free Press has a nice round-up of the various photo frauds. The long, detailed and heavily researched article "Why is there so much Anti-Israel Bias in the Press and The American Educational System?" claims that the Saudis own a substantial stake in Western media companies and influence their coverage to be anti-Israel. Not a link, but a funny final footnote nonetheless: zombietime reader Philip S. points out that if you rearrange the letters of "Adnan Hajj from inside Reuters, Inc." you get "Man 'errs' for jihad; End an injustice!" If you know of any other noteworthy examples of Reuters fraud in its coverage of the war in Lebanon, or if you have comments or corrections about this page, send an email to zombietime here.